I am back with another DIY project for you. 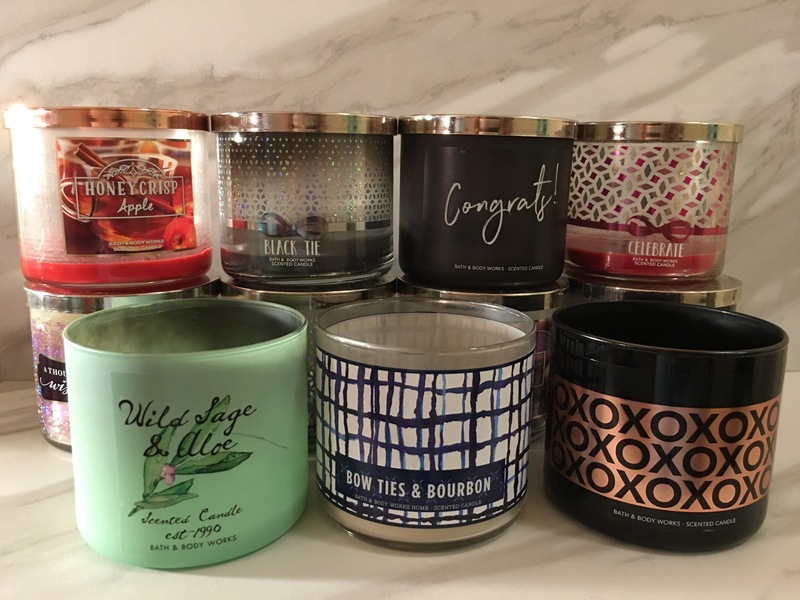 I LOVE Bath and Body Works/ White Barn candles. I mean I have one burning in every room of my house. I buy them all year around but I mostly stock up during the $8 holiday sale. As much as I enjoy burning these candles, I hate throwing them away.So I don’t. I collect burnt out candle jars, until I find a DIY project to use them for. 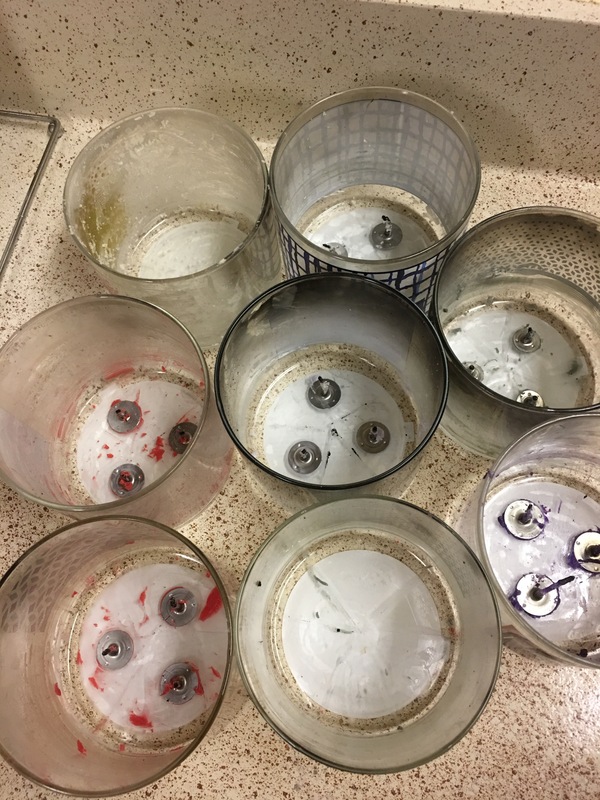 Here are the 11 candle jars I’ve saved this year. Today I am going to try my best to show you how to clean and reuse them. For this project you will need: a butter knife, hot water, a small plastic bag, and cleansing supplies. 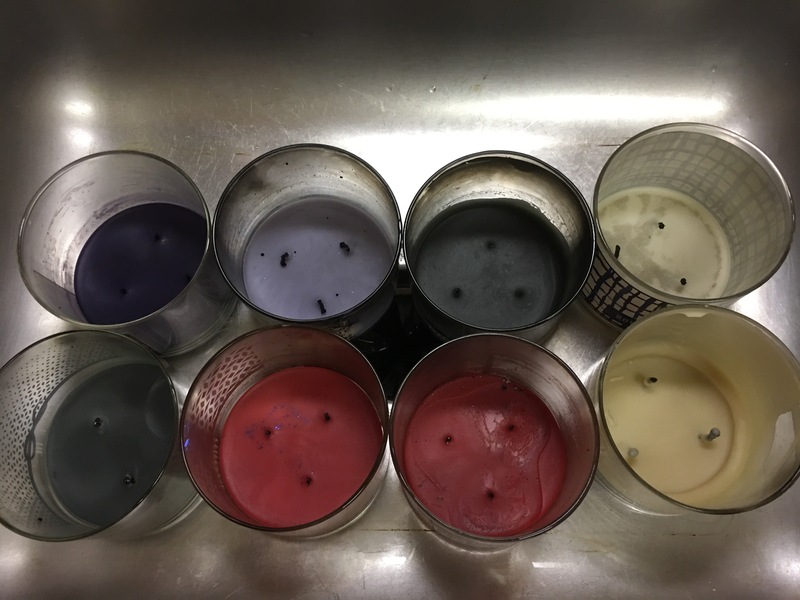 In this photo you see the inside of each candle jar. This is the starting point. 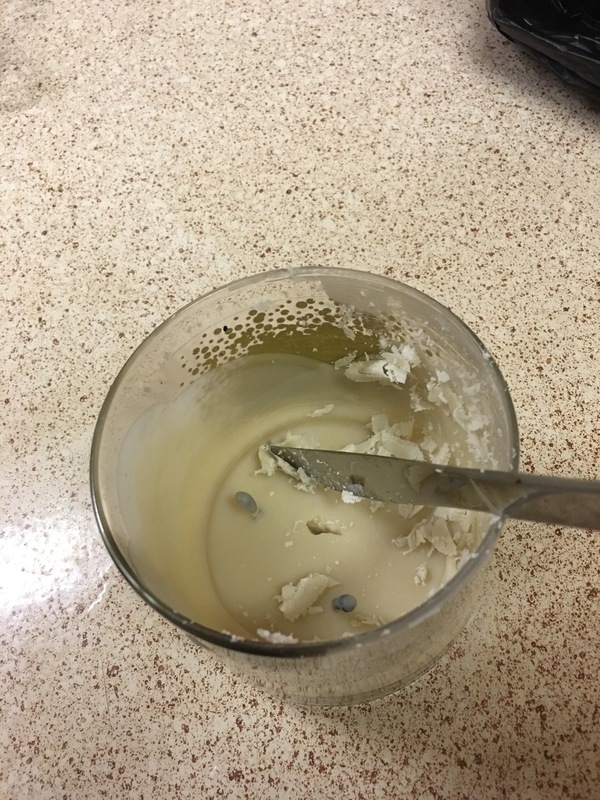 First step: Using the butter knife, break up the leftover wax inside the candle jar. I find this process to be fairly easy. 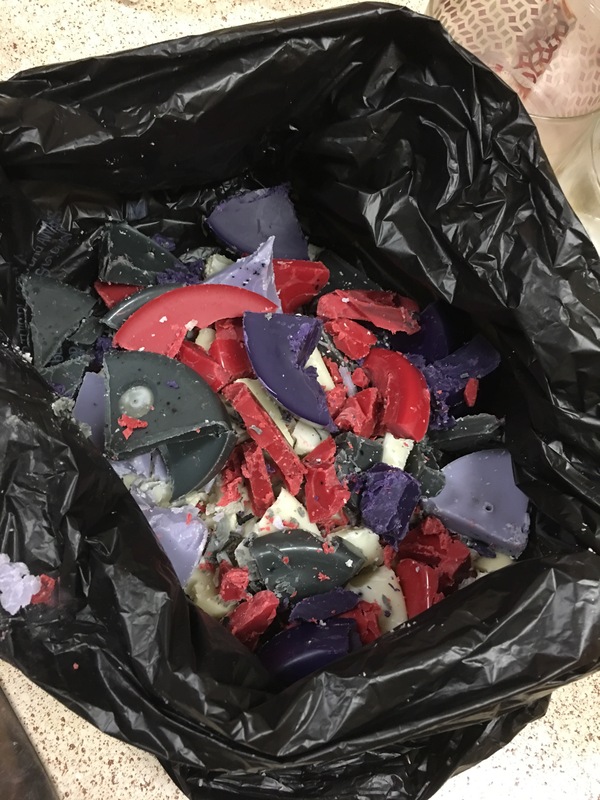 The soft wax break up into chucks then pick them out. Be sure to place them in a plastic bag for disposal. DO NOT flush them or put them down you drain. Second Step: Fill the jars with hot water. 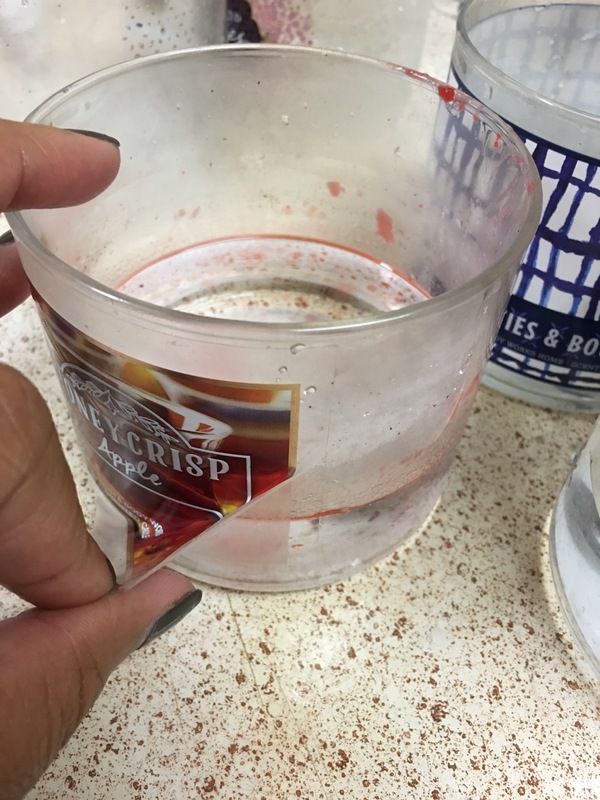 The hot water melt the glue holding together the wick to the bottom of the jar. The hot water will also allow you to easily pull off the front label of the candle jar. Third Step: Use your cleaning supplies to scrub/ wipe off any debre left on the candle jar. So you may have to scrub really hard, others will wipe clean easily. If you are having trouble, I have found that soaking the jars in hot water and clorox for at least a hour. Fourth Step: Towel Dry !!! 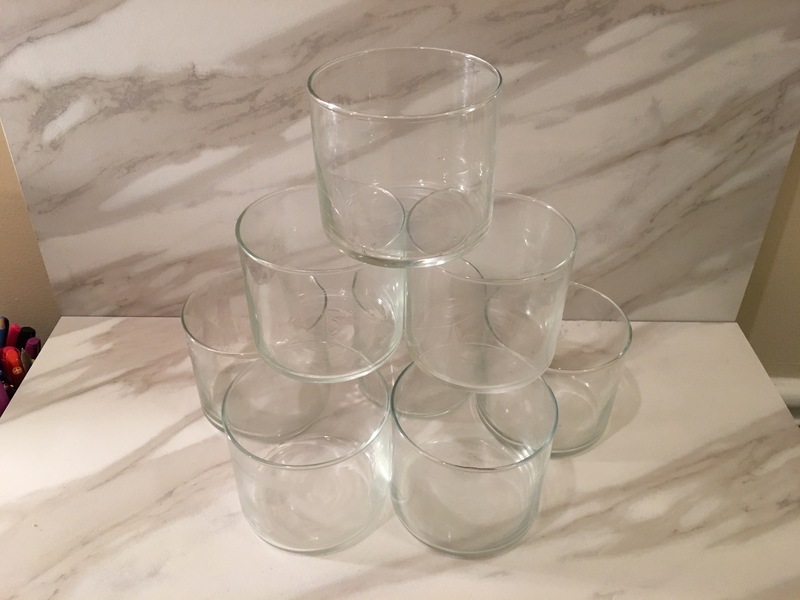 These jars are going to be used as vases for centerpieces for a wedding I am planning. Check out my Kreative Passions Page to see the Glam Holders I’ve made previously…. If you like this DIY blog, please like and share. Be sure to comment below any DIY projects/ ideas you’d like to see me feature. It’s the best, a small change from the constant buy buy buy throw throw throw lifestyle ! Great project – to reuse containers for something else. Great project! Such a great way to minimalize your trash! Glass jars are always great things to have around! Wow. Those candle jars are beautiful! I’m definitely trying this out! Lovely post!